The Tweedsmuir Ski Club cross country skiing area is an incredibly beautiful circuit of 30 km of trails all maintained by dedicated volunteers. The area for cross country is off limits to all snowmobiles in accordance with the Tweedsmuir Park Master Plan. Please respect this, there are 1000's of square kms of excellent snowmobiling without going into this area which is the area east of the parking lot and the south side of Highway 20. Our cross country skiing area is legendary for the long season we have. It is normal to see the Old Highway Trail groomed and ready by Remembrance Day and by Christmas most of the remaining trails are groomed and ready to ski. It's only a lack of interest in April, gardening and fishing in the Bella Coola valley that stops cross country skiing and the volunteers who maintain all the trails. 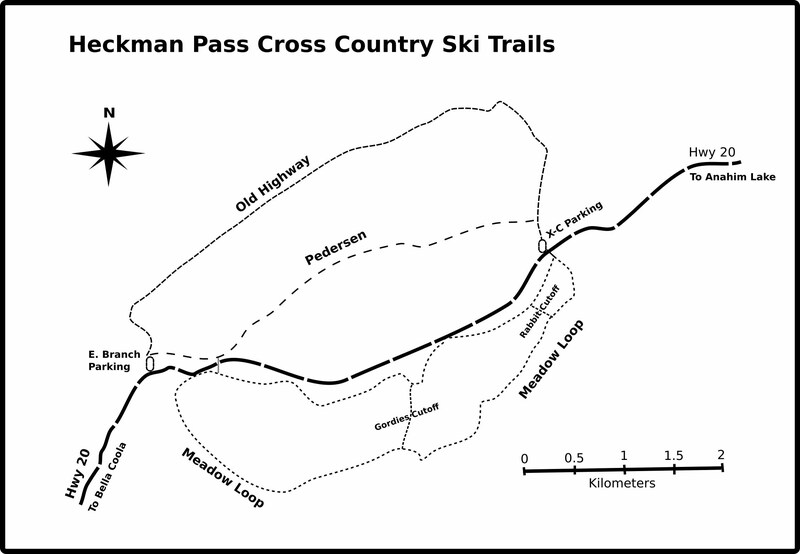 There are two possible starting areas for the cross country ski trails. 1. The Eastern Cross Country Trail Head is the preferred starting area. It is adjacent to Highway 20 about 5 km east of the East Branch parking lot where the Old Highway comes out to Hwy 20 (52o 32.60’N, 125o 45.37’W). A parking lot is available but if it is not plowed you can park along the roadside where it has been the practice to park only in the direction heading to Bella Coola (to the west) to avoid congestion. Here you will find the eastern end of the Old Highway Trail or the start of the 12 km Meadow Loop Trail on the south side of the Highway 20. A short distance up the Old Highway Trail are outhouse facilities and the east junction of the Pedersen Trail. 2. East Branch Parking lot (52o 32.07’N, 125o 48.75’W). You can either ski the 7 km Old Highway Trail, or take the 5 km Pedersen Trail from the parking lot. 1. The Meadow Loop trails - Good for all levels of skiers and are probably the best choice if you are a novice or beginner skier. The best place to start is at the Eastern Cross Country Trail Head. It is preferable to travel in a clockwise direction so that you are going up hill on some of the steeper hills. You can ski a short loop if you take the Rabbit cut off and end up back at the start area. For a longer ski you can take the Meadow Loop trail and ski until you hit Gordies cutoff trail and connect with the return loop of the Meadow Loop trail back to the start area which is approximately 7 km in length. You can also do the full Meadow Loop trail which is 12 km in length. These trails have some wooded sections with a few steeper hills but for the most part are fairly flat and open. 2. The Pedersen and Old Highway Trails – These two trails form a 12 km loop. It is recommended that you travel in a clock wise direction so that you are going up hill at the Western Portion of Pedersen trail where there are some steeper hills. The Old Highway Trail is sometimes groomed for skate skiing as well as the classic nordic track. The Old Highway may be the only trail groomed during low snow conditions in the early season. There are no charges for using the trails but we ask that you join the Tweedsmuir Ski club as your contribution to the costs of maintaining the recreational area. All the trails are maintained by a few dedicated volunteers using their own snowmobiles for grooming, so please enjoy and respect this beautiful area. Come out to the annual Cross Country 7, 14 and 21 km race, see if you can win the trophy! !